Innovation has become the benchmark of success, particularly in the modern world. Companies and institutions in every field are stepping up their efforts to become more innovative in the way they work, communicate and produce the goods and services they sell. But with such an objective, the obvious challenge becomes, how to identify the individuals who possess the greatest potential to innovate. Hence nurturing young innovators has become a much needed task today. Nalanda College, Colombo, established a Research Forum in 2013 as a means of filling this void. Nalandians from grade 9 onwards are eligible to join the forum. They already have around 150 members in the group who constantly engage in research work in various fields. These students are given the opportunity to take part in national and international competitions. They have already won accolades at competitions like the Intel International Science and Engineering Fair (Intel ISEF), Science Olympiad, International Environmental Sustainability Olympiad, International Science Project Olympiad, Earth Science Olympiad, and the International Sustainable World Energy Engineering Environment Project Olympiad (I-SWEEP). Their work is supervised by well known academics from universities and institutes. Rakindu Wickramarathne has excelled in this field and has come up with some important discoveries. His project is based on the disposition of air pollutants on pollen grains and the occurrence of respiratory allergies among humans. He will be getting the Queen’s Young Leaders Award for his research. Around 60 youth from across the Commonwealth countries will be getting the award and Rakindu along with Senel Wanniarachchi has been selected from Sri Lanka to be presented with the award in June. 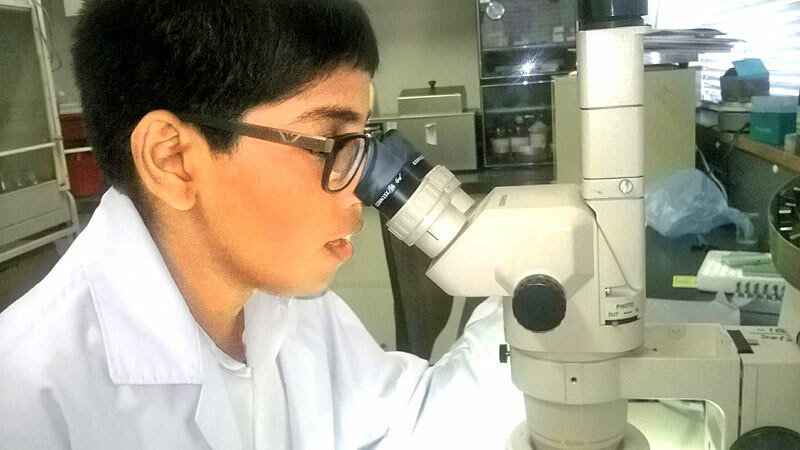 Another feather in Rakindu’s cap is the opportunity to represent Sri Lanka at the International Conference for Young Scientists that will be held in Germany in April. Two Sri Lankan students have been selected to take part in the event. He also won first place at the competition held by the National Science Foundation. Around 842 schools took part at the event and 29 projects were selected for the finals from them. The top ten students will to display their projects at the Sri Lanka Science and Engineering Fair that will be held this month. From there the top ten researchers as well as the top ten inventors will venture to California to take part in the Intel ISEF. Q: Tell us briefly about your project. A: I started my project in July 2016 when I was in grade nine. It took around 6 months to complete. Pollen is microspores released from flowers. These pollen grains enter the human respiratory system and trigger a type of seasonal allergic rhinitis called pollen allergy/hay fever. The purpose of the study is to note the morphological differences of pollen grains from four different plant species commonly found in the Colombo city as well as in rural areas. The study attempts to identify the chemical composition of the deposits (if any) of pollen grains due to gaseous pollutants. Pollen was separately obtained from Samanea saman (Rain Tree), Delonix regea, Tabebuia rosea and Peltophorum inerme trees growing in the Colombo city and rural areas. They are observed through a Scanning Electron Microscope after processing through standard methods. Whenever the pollen samples with deposits and secretions were identified an energy Dispersive Spectroscopy analysis was carried out at the Sri Lanka Institute of Nano Technology to detect the chemical composition of the surface of the pollen grains with dispositions and secretions. Dispositions were identified on the pollen grains of Samanea saman obtained from the urban area while it was absent in the rural areas. Likewise secretions in pollen grains of Delonix regea were more in the urban area than those in the rural areas. There was not much difference in the components in Tabebuia rosea. The Energy Dispersive Spectroscopy showed mainly Carbon and Oxygen. Nitrogen 28.08 percent and Sulphur 0.15 percent was present in some samples. Q: Why did you decide to do research on such a topic? A: I am a wheezier from my childhood. Therefore I really wanted to do a research on respiratory allergies. When I did literature surveys I found out that pollen grains are a crucial issue in many countries. Therefore I thought that if air pollutants can also be present in them the situation must be severe. Also according to the Medical Statistics Unit in the Health Ministry asthma related mobility and mortality is quite high in Sri Lanka. Q: What is your conclusion? A: Air pollution such as ionic components and gaseous pollutants can be present in the surfaces of pollen grains as Nitrogen, Oxygen and Sulphur. This is evidence that pollen grains of plants can also carry air pollutants and contribute to triggering asthmatic conditions. Therefore when man harms the environment by creating air pollution the environment too pays back by harming humans by setting the stage for respiratory allergies. Q: How do you propose to combat this issue? A: If air pollution is less these respiratory allergies can be minimized. Q: What were the challenges you faced during your research? A: Electron Microscopic studies and Energy Dispersive Spectroscopy has very limited facilities in Sri Lanka. I had to wait for the Energy Dispersive Spectroscopy results for a long time. Q: Tell us a bit about your family. A: I am the only child in my family. My father, Keerthi Wickramaratne, is the Senior Medical Laboratory Technologist at the Electron Microscopic Department of the Medical Research Institute. My mother, Jeevanie Gunasekara, is attached to the Blood Bank at Apeksha Hospital. Q: Who supported you during your venture? A: All this could not have been possible without the support of our principal Ranjith Jayasundara. Upeksha Abeysekara, the teacher in charge of the Nalanda Research Forum, has been extending her support and advice to me throughout the project. My supervisors were the senior lecturer/ head of department of the Department of Plant Sciences at the Colombo University Dr S M W Ranwala, the Deputy Provincial Director of Health Services in the Western Province Dr Anil Samaranayake, Research Officer in the Electron Microscopic Department of the Medical Research Institute P G S M de Silva and Senior Medical at the Labortory Technology IT of the Electron Microscopic Department of the Medical Research Institute K Wickramarathne. Everyone supported me at the school. I am especially grateful to the Sri Lanka Institute of Nano Technology, Professor K M D Nalin de Silva and A D M Damayanthi. A: I play squash and scrabble. Engaging in this research motivated me to do literature surveys. That has become a bit like a hobby for me now. Q: What is your ambition? A: I would like to become an aircraft engineer. Q: What is yaour message to other youth who are vying to engage in research? A: I believe that the world needs more knowledge. Research is how knowledge is gained according to Joe Tye. I go by that motto. Research and inventions are very important. Try to do something innovative. One of the main aims of a school is to encourage the research skills of its students. This is the secret of success in many developed countries across the world. China has given an important place to research work in universities. They even consider research as a plus point when they are given salary increments. We established the Nalanda Research Forum with this goal. Our students have won a lot of glory by taking part in international events. Rakindu’s work is a fine example for many other youth to motivate them to engage in research. There is always room for research in what is included in our syllabus. Upeksha Abeysekara anchors this project. She has taken on the task with immense dedication without limiting her time to her duties. This is what helped to reap such results and bring glory to Nalanda College.